Two very general principals guide our restoration of native habitats and ecosystems. The first is that restoration sites should be developed as biodiversity centers, which can function to preserve as many native species as possible and to spread these species into other habitats in the future. All native habitats in our regional watersheds are rare. The few surviving habitats are usually highly degraded, and thus low in ecological diversity. Historically, these same native habitats covered very large geographic areas. Therefore, all restoration areas in the present human disturbed landscape should be biodiversity centers, unless there is some compelling ecological or socioeconomic reason not to do so. The second guiding principal is that restoration is a natural process. The main focus should not be on static plans, but on this active process of ecological succession. A primary restoration goal is to establish a natural succession of native species, often using aggressive early native colonists to help control invasive non-native weeds. These weeds usually dominate grazing lands, farm edges, and non-agricultural open space throughout watersheds. Whenever possible, weed control should be part of the natural process of ecological succession. Each restoration site is a spatial and temporal mosaic of native habitats and species. There is no static end point. This is especially true for rare annual plants that depend upon the periodic provision of open space, which is usually created by disturbance to perennial species. We have been able to restore native ecosystems from salt marshes to sand dunes, including wetland infrastructure throughout our local and regional watersheds. 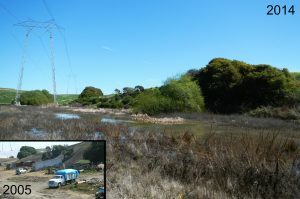 Since its inception, we restore ecosystems in partnership with the Central Coast Wetlands Group at MLML.